Make instant fire using sugar, potassium chlorate, and sulfuric acid. 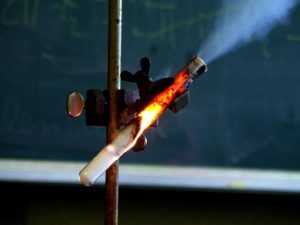 No matches or flame is needed for this exciting chemistry demonstration! You can do this demonstration in a test tube or on a heat-safe dish. Goggles, gloves, and a lab coat are recommended. Don’t use glassware you value too highly, since there is a good chance the highly exothermic reaction will shatter it. Mix together roughly equal amounts of potassium chlorate and sugar. Add a drop or two of sulfuric acid to the mixture to start the reaction. That’s it! Expect purple flames, smoke, and heat. This is a decomposition reaction in which potassium chlorate breaks down in potassium chloride and oxygen. Potassium chlorate is a powerful oxidizer. Adding sulfuric acid provides enough heat to accelerate the reaction. Once there is sufficient heat, the oxygen from the reaction burns, using sugar as the fuel. Another way to do this demonstration is to make a candy, such as a gummy bear, appear to dance in the flames. Secure a large test tube to a ring stand to hold it in place and so you’ll be able to distance yourself from it. Heat a small amount of potassium chlorate in a large test tube. Once the potassium chlorate has melted, add a gummy bear candy. Here’s a quick video of this chemical reaction, so you can see what to expect. There are two things you’ll notice here. First, the potassium compound produces a bright purple flame, just as you would expect from a potassium flame test or bead test. Second, it’s important to use a heat-safe container and surface and proper safety gear when performing this reaction, because once it takes off, it gets exciting quickly!